A Girl for All Time – Oh Sew Kat! A Girl for All Time Sewing Pattern- The Sixth Grade Skirt by Oh Sew Kat! 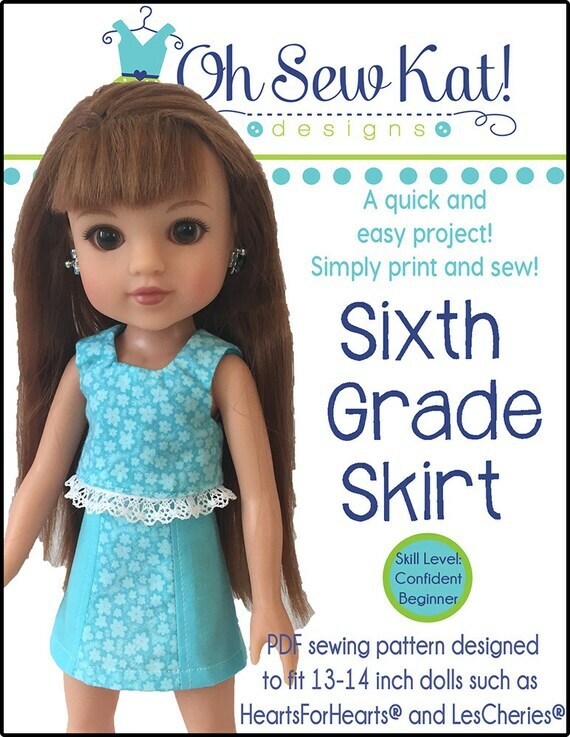 The Sixth Grade Skirt pattern is now available for 16 inch ball jointed dolls like A Girl for All Time®. Some of my AGAT patterns may also fit Sasha dolls, depending on the fit. Find the Sixth Grade Skirt for A Girl for All Time® Dolls in my Etsy Shop. This A line style skirt is very quick to sew, but offers lots of options by adding pockets (see this TUTORIAL) or lace (see this TUTORIAL). Visit the Inspiration Gallery for even more ideas. 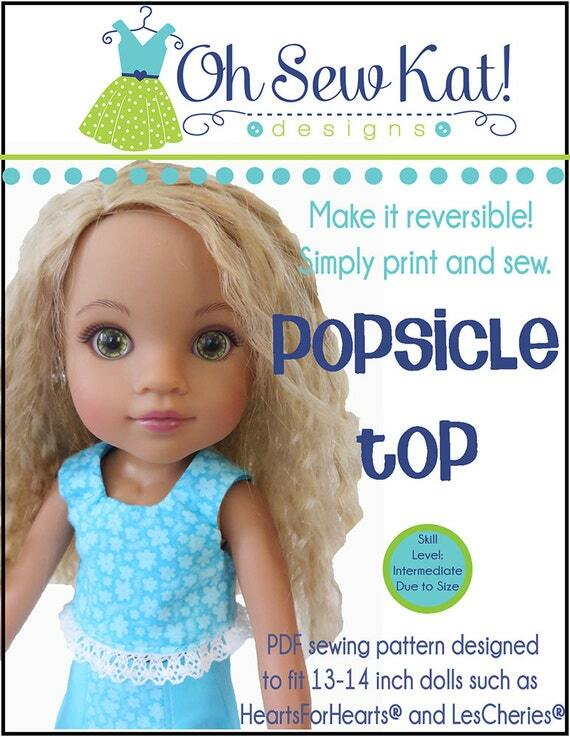 Find this pattern HERE and the Popsicle Top to go with it HERE. 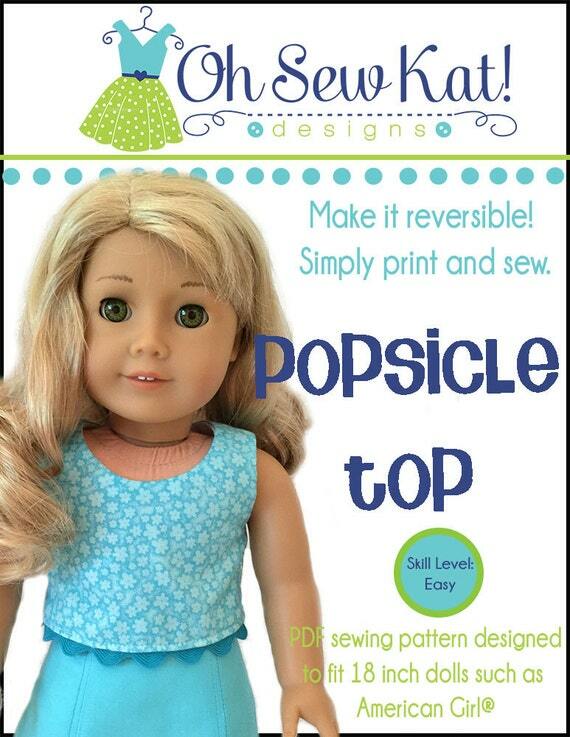 The Sixth Grade Skirt is a very easy sewing pattern for A Girl for All Time Dolls. Find the pattern in 5 other popular doll sizes, and also in some value bundles HERE. 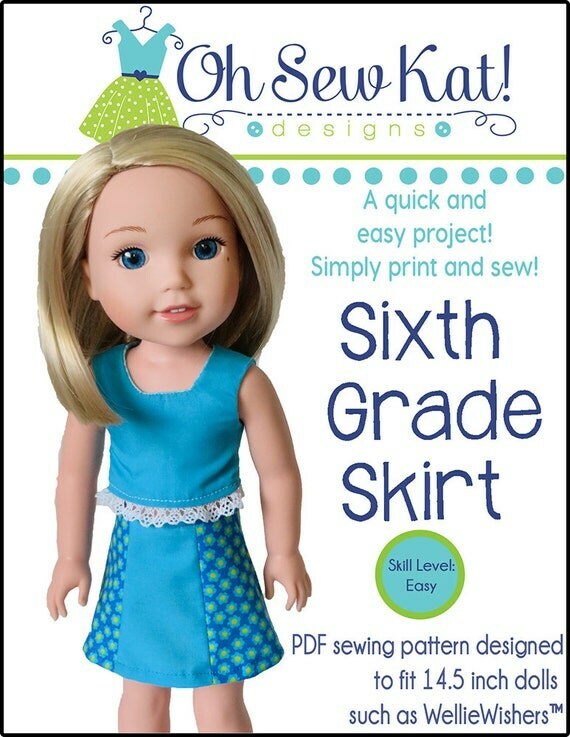 Make an adorable Sixth Grade Skirt for your A Girl for All Time® Doll. 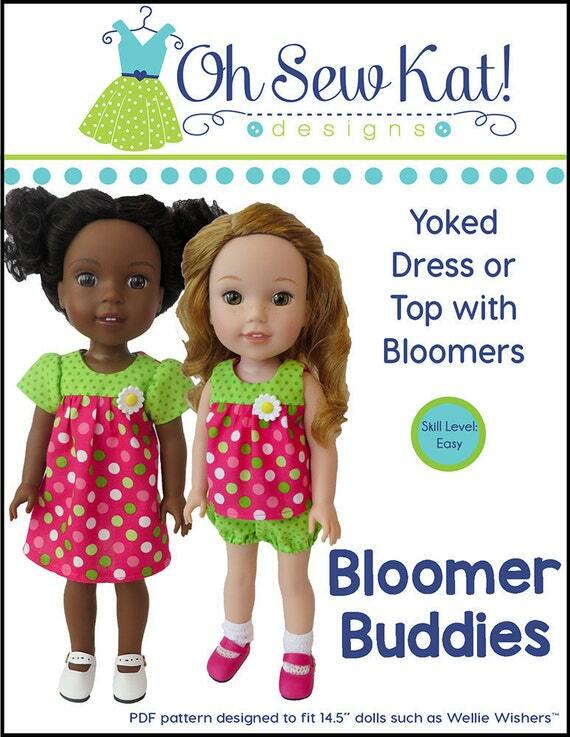 As a pattern designer for doll clothes patterns, I rely very heavily on the work of my tester group. These women fearlessly sew my “not quite ready for prime time” patterns and let me know how they work, how they fit, and if there need to be any tweaks. I’d be lost without them and really appreciate the time and effort they give me on each and every pattern. Shirley has tested for me for a few years. Her creativity is unmatched and her beautiful photos show the attention to detail she puts into every single outfit. Stop by and visit her Etsy Shop to see what she has for sale. The Playground Pants pattern is designed for cotton fabric, but as you can see, it’s beautiful is soft knits as well. Find the pattern for A Girl for All Time® Dolls HERE. Love this cute little ruffle at the top of the pocket! The Playground Pants pattern for A Girl for All Time can be found in my Etsy Shop, and on Pixie Faire. It’s also available in 3 other sizes. See more ideas for this pattern HERE and HERE. 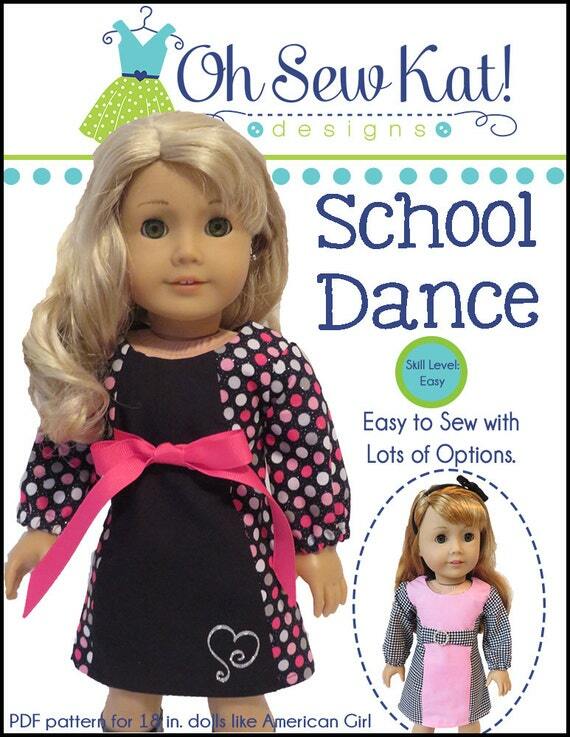 Sew a Holiday Doll Dress with Sewing Patterns by Oh Sew Kat! Oh Sew Kat! patterns are quick and easy. 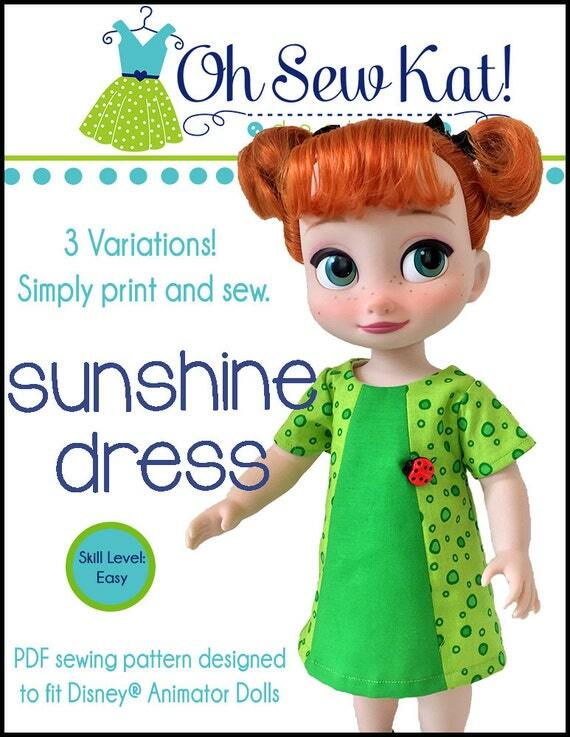 Choose a fun, holiday print and stitch up a new dress for your doll this holiday in just an afternoon! The design is in the details. Add pretty piping or fun buttons and bows to enhance your dress. 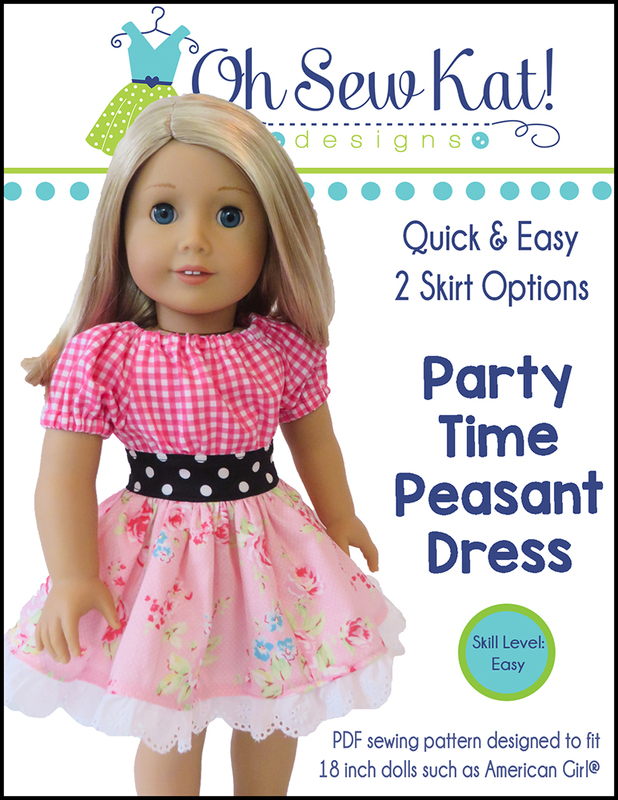 The Party Time Peasant Dress is a quick to sew pattern for dolls, that will give lots of “WOW” when you choose fun, holiday themed fabrics. This pattern is available in five popular doll sizes: 18 inch dolls, 14.5 inch dolls, 15 inch baby dolls, 16 inch Animators dolls, and 16 inch A Girl for All Time® Dolls in my Etsy Shop. Because PDF patterns are instant download, and you print them at home, you can sew one up without even leaving your house! 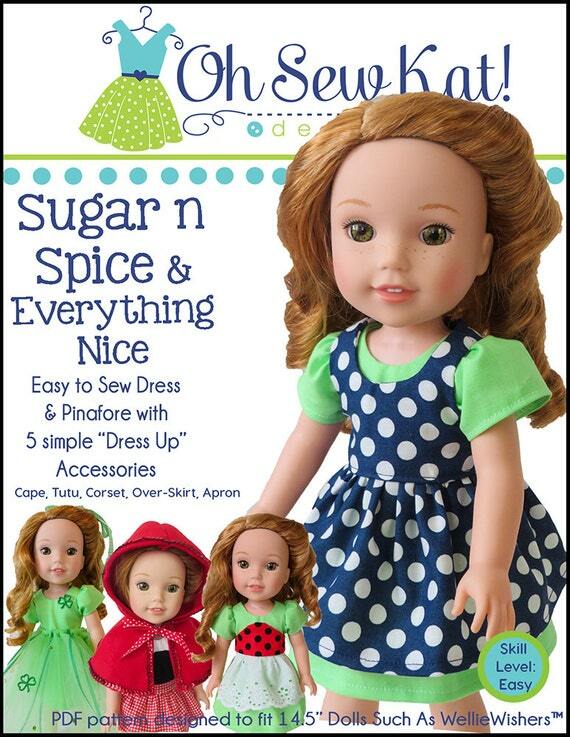 Be inspired by these fun, holiday dresses and sew one up for your favorite doll today! Kelly’s snowflake dress was made with the Party Time Peasant Dress. Use the Bloomer Buddies pattern for a Christmas Classic, like Riley’s dress below. 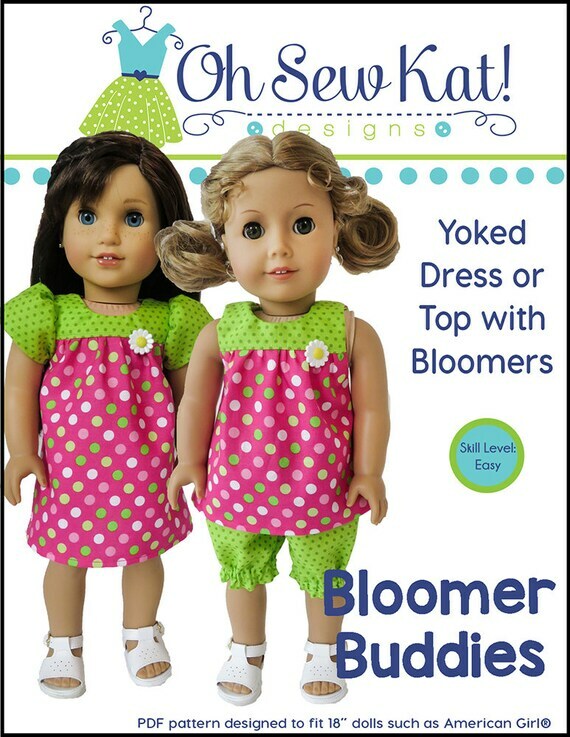 This polka dot dress is also made with the Bloomer Buddies. I just made the sleeves longer. Maryellen’s Dress was made with the School Bell Blouse pattern, using this easy Pattern HACK. Make holiday dresses for your Wellie Wishers 14.5 inch sized dolls too! Willa’s dress is made with the Party Time Peasant Dress. 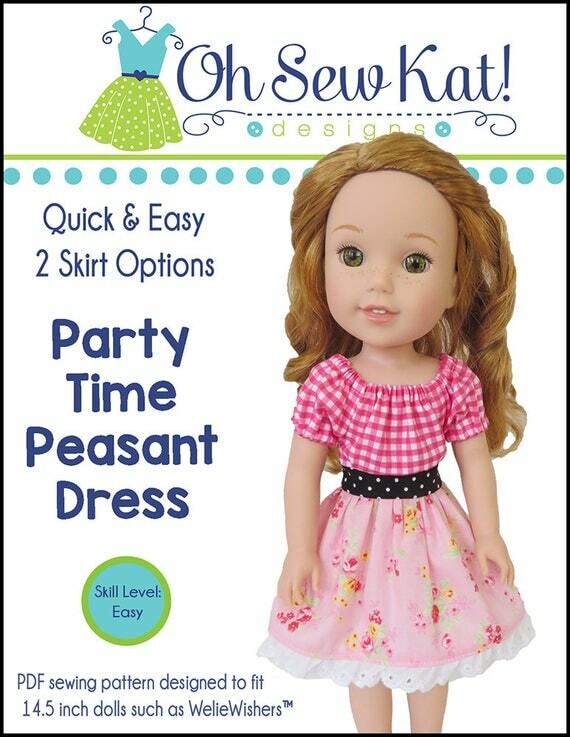 The Party Time Peasant Dress is also available for A Girl for All Time Dolls. 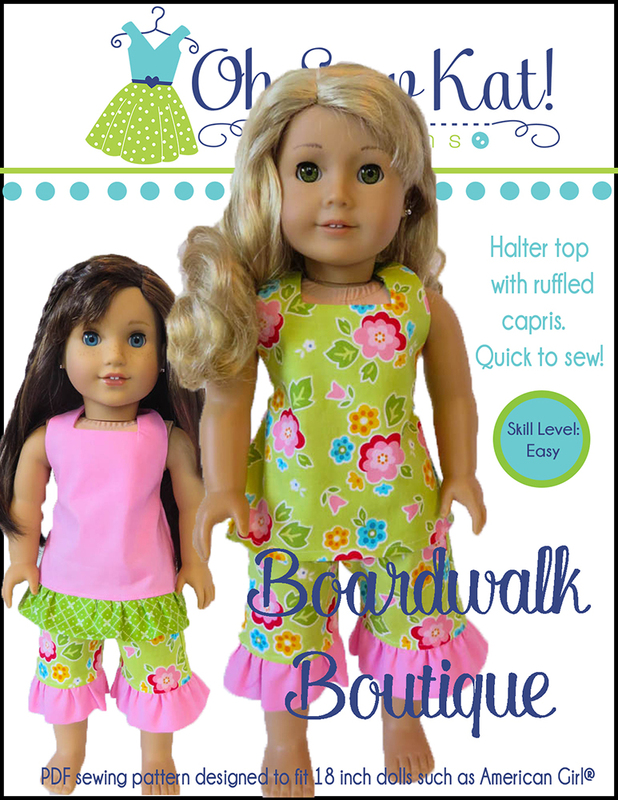 Have fun putting a holiday twist on your doll clothes this season!! See more Party Time Peasant Dresses here and here! Find more holiday ideas here and don’t forget to visit the Inspiration Gallery. Find the entire Oh Sew Kat! pattern catalog HERE. **This post has affiliate links. See my policy HERE. 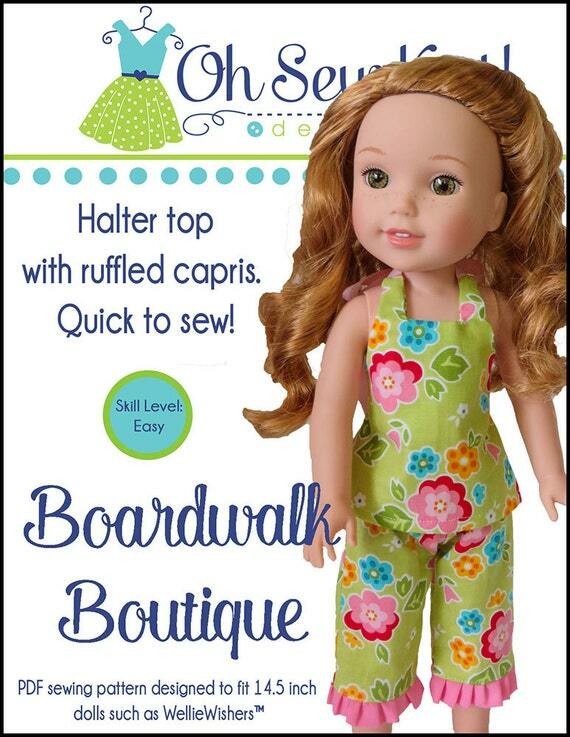 Looking for a few ideas for the girls, doll lovers, crafters, and seamstress (sewists) on your list? 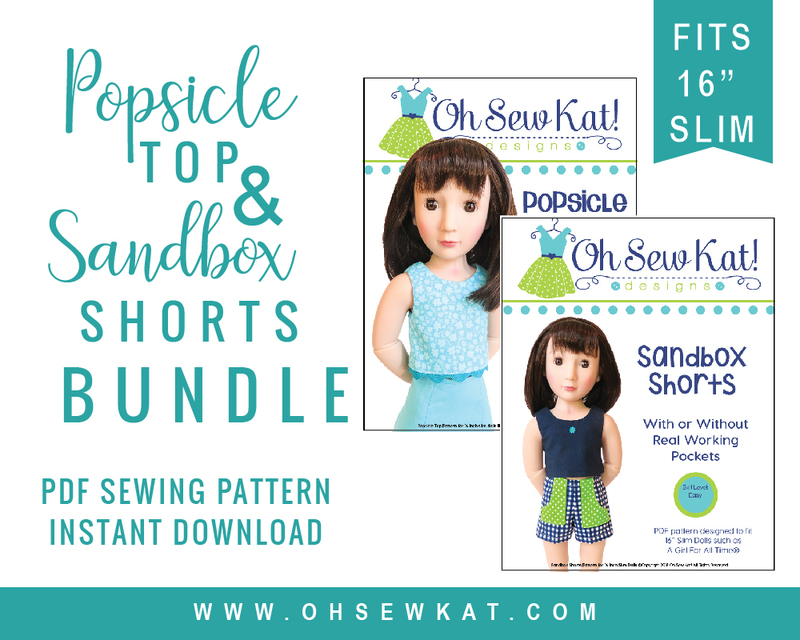 Here are a few top picks from Oh Sew Kat! Glitter Girls!! These new, smiling dolls are the exact same size as the Wellie Wishers™ dolls made by American Girl®, but you can get them for less than half the price. There are ten different dolls to choose from and they are poseable too!! How much fun with that be for the little girl in your life? A Girl for All Time Dolls: These 16″ poseable dolls are fairly new to the doll market. They have a loyal following and wonderful stories, most of them historical. Over time, I think you will see them more and more, not only in pattern shops, but in doll clothes shops too! 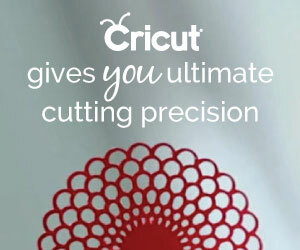 I absolutely have used and love my cricut products for years and years and years. There are just so many wonderful things you make with these electronic cutter machines from tee shirts to coffee mugs, to journals, to doll clothes. See how I cut my doll clothes patterns with my Cricut Maker machine HERE. Does she want to learn something new? How about crafting classes at craftsy.com? Sign up for a free trial and see what you want to learn! These are hands down my favorite scissors. I have four pair of them. Every seamstress needs a good walking foot. Be sure to find the correct one for her brand and model of sewing machines. They vary widely in price, but are well worth the extra investment, especially when sewing silky and knit fabrics. Doll dresses are so much easier with a ruffler foot. Again, ensure you choose the correct brand and model for her sewing machine. This amazing tool is my favorite for skirt ruffles and for gathering doll skirts! This Brother sewing machine is a perfect starter machine for anyone that is new to sewing. It’s lightweight, and strong, with a wide variety of basic stitches. Find a few more tools that make great gifts in THIS POST. Need a few sewing tool stocking stuff ideas? Try this post and this one to see my favorite tools of 2017 and 2018. 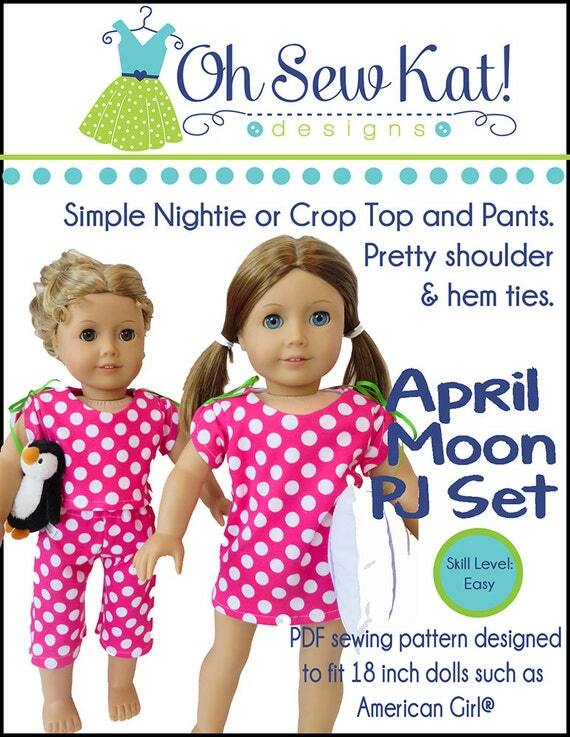 How about some easy to sew patterns for her dolls? Choose from a variety of styles and sizes at http://www.etsy.com/shop/ohsewkat. Put them on a cute thumb drive and tuck them in her stocking! Fun fabric packs to sew doll clothes with? Yes, please! Here is an adorable bundle from one of my favorite designers, Riley Blake. Find these doll sized stripe bundles at www.cricut.com. Now available! 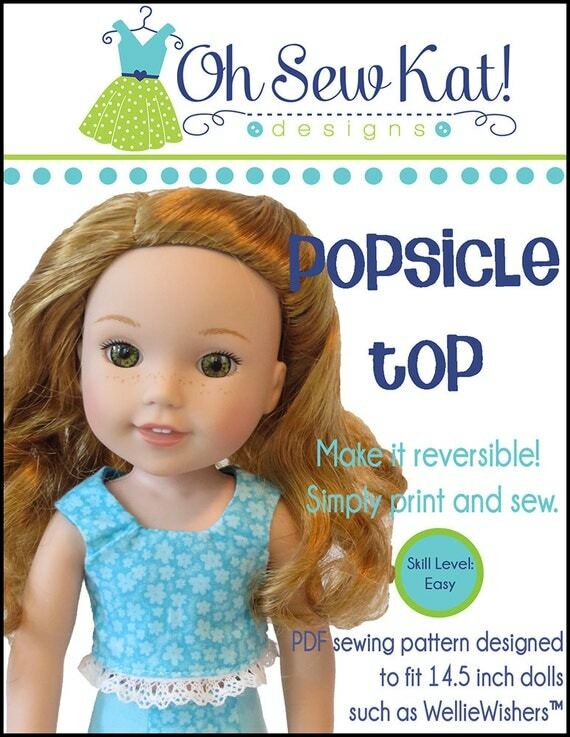 A new pattern for your 16 inch poseable A Girl for All Time® Dolls. The Playground Pants pattern for the A Girl for All Time Doll line is easy to sew but offers lots of fun options, including pieced side panels, working pockets, and an elastic waistband for easy dressing. These loose fitting pants are perfect with the Playtime Peasant Top or the Popsicle Top, patterns also available from Oh Sew Kat! 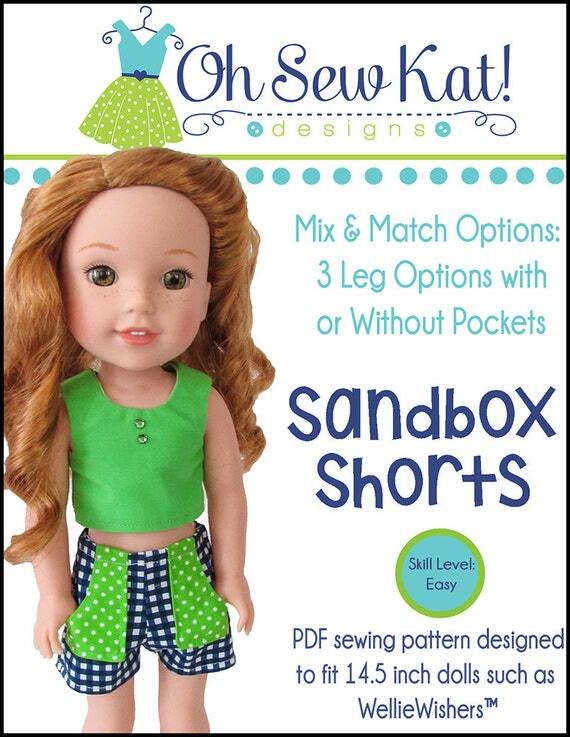 Sew an easy pair of pants for your A Girl for All Time Doll® with this easy PDF pattern. These pants work great for boy dolls too! Stitch them up in a light denim or classic khaki! The playground pants are perfect for all year round and are quick to sew! See more ideas for the Playground Pants here and here. 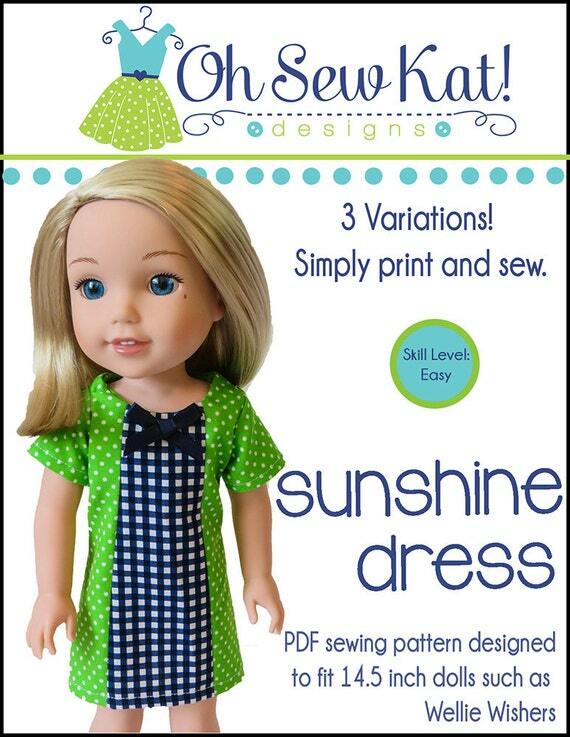 This pattern is also available for 18 inch dolls, 16 inch dolls, and 14.5 inch dolls where Oh Sew Kat! patterns are sold.